The goal of the FDM quality guidelines is to improve FDM printing standards globally. These guidelines reflect the part quality you should be able to obtain using a well-calibrated machine and post-processing. FDM parts need to be produced within an accuracy of ±0.5 mm or 0,5% depending on which is greater. For example, in the case of a 40 mm cube, a 0,5% accuracy requirement would result in a max of 0.2 mm deviation. As this is below 0.5 mm, the 0.5 mm is leading and determines the maximum. A printed part of 40.2 x 39.7 x 39.6 mm would be acceptable as the deviations are within this 0.5 mm. 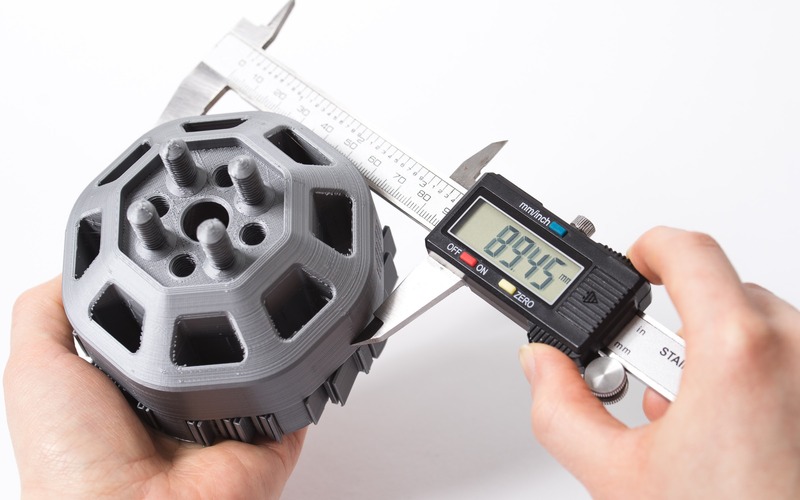 Printing a cube that is 38.8 x 39.4 x 39.4 mm would not pass the dimensional accuracy requirements as the width deviates more than 1 mm. If you cannot meet this dimensional accuracy guideline with a certain material, the material in question might not be able to meet a customer's expectations and should not be offered. For example, if you are not able to prevent a part from warping while printing with ABS, you should discuss with your customer and either switch to another material that is less prone to warp (such as PLA) or the order should be canceled so your customer can switch. 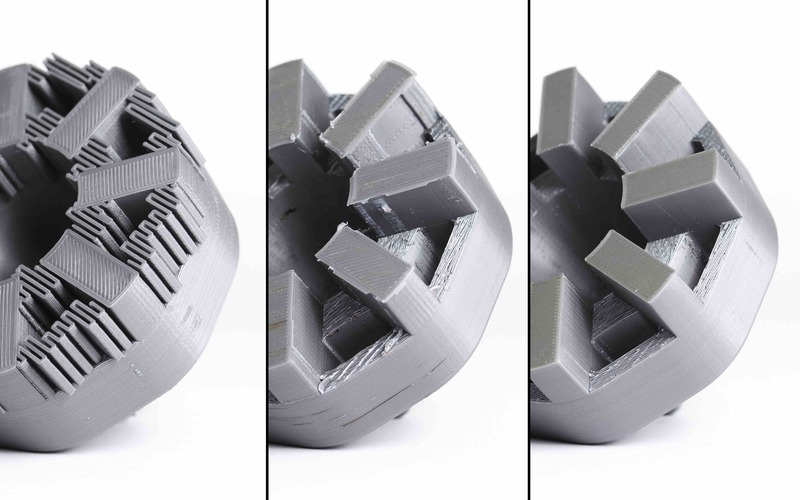 This image depicts a print that meets the dimensional accuracy requirements. If other settings are required by your customer, you have the option to overwrite the 3D Hubs calculated Sliced Material Volume amounts which will automatically recalculate the prices on the order. Consistent Surfaces. The final print shouldn't have any inconsistent surfaces. 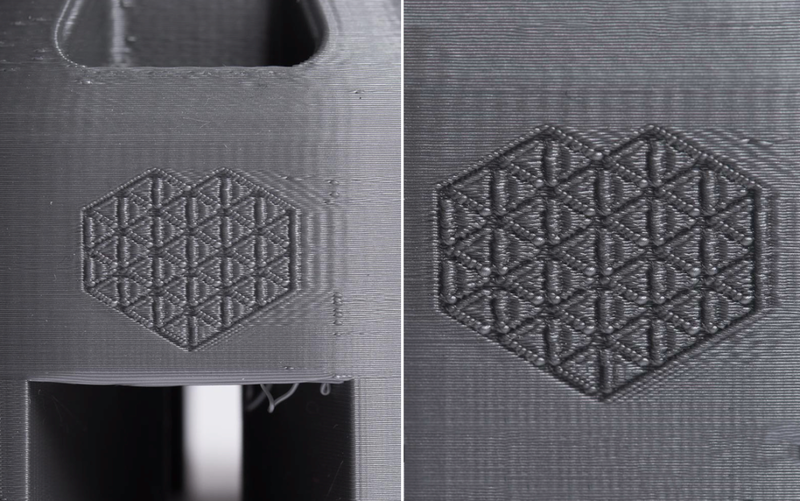 Retraction marks and a layer changing "seam" are acceptable. No delamination. The layers should be firmly attached, resulting in a print without gaps or cracks. Small details. Details larger than 0.8 mm in the model should be well discernible in the print. If details on the customer's model are (too) small, inform your customer of the result he can expect. Please review the appendix for examples of what we consider poor surface quality. The customer should always be informed during the "Technical Review" step when one or more models in an order require support material and which parts of the model will have support traces. If additional costs are required, they should be added during the Technical Review step. All support material must be removed and brought down to a level where the surface is continuous. Small traces of support material are often unavoidable and acceptable (see image). A 150 micron PLA print showing properly removed support material. 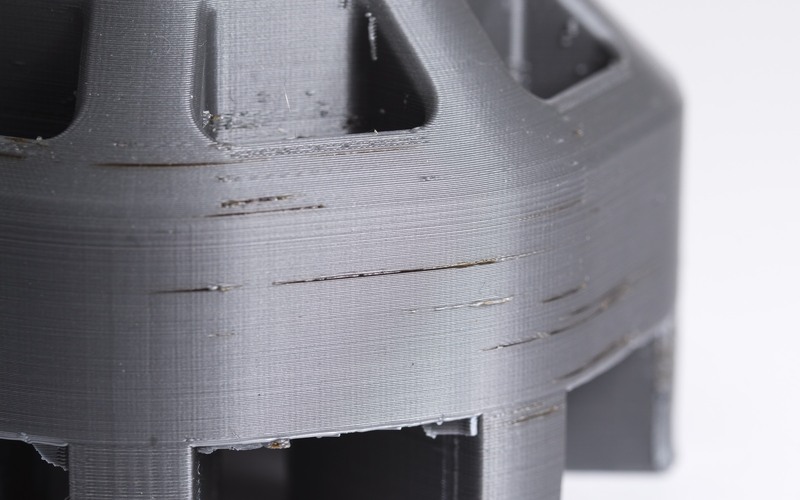 These guidelines apply to all FDM orders on 3D Hubs and can only be deviated from when specifically discussed and agreed upon between Hub and Customer in the comments section on the order page. If a customer raises a dispute, prints are reviewed against these quality guidelines. If the print doesn't meet the guidelines, the customer has the right to be refunded under the 3D Hubs Buyer's Protection. Poorly removed support material. Support material should be reduced to a minimum to reduce inconsistencies in the print delivered to the customer. 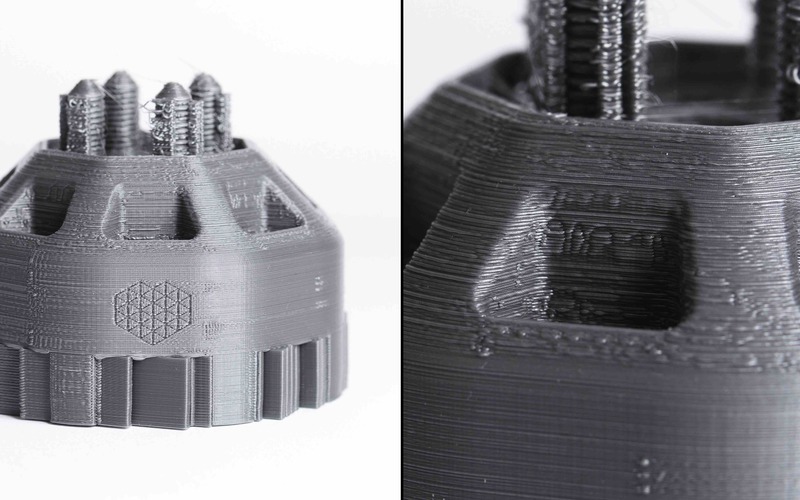 The left image shows the 150 PLA print with supports still attached, the middle image shows the part with poorly removed supports and the right image show the print with properly removed supports. Inconsistent surface. Parts should have a smooth surface with minimal deviations. The images below do not meet the quality guidelines and would entitle the customer to either a reprint or refund. A 150 micron PLA print with inconsistencies throughout the print which does not meet the FDM Quality Guidelines. Under-extrusion. 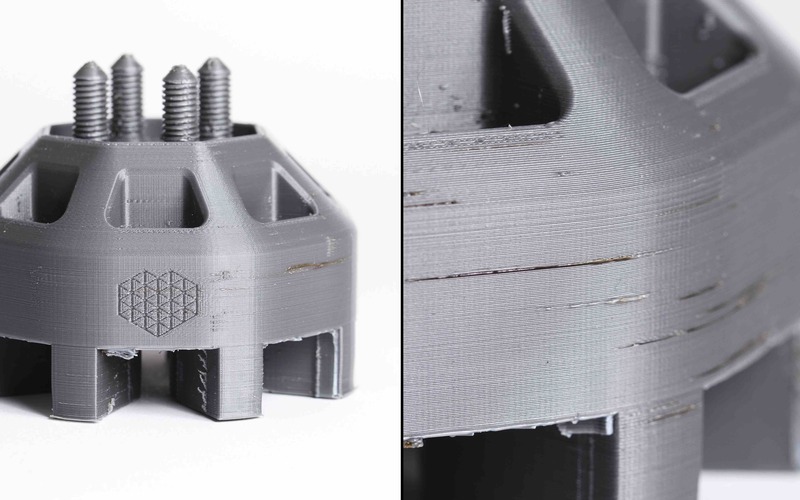 Under-extrusion causes very weak prints with inconsistent layers.Parts should be solid with no signs of extrusion inconsistency. A 150 micron PLA print suffering from under-extrusion that does not meet the FDM Quality Guidelines. A 150 micron PLA print suffering from over-extrusion that does not meet the FDM Quality Guidelines. Invisible small details. If you accept orders that contain models with extremely small details you indicate that you printer is capable of printing these. In some cases, it's better to decline these and advise customers to switch to another 3D printing technology capable of higher precision, SLA for example. A 150 micron PLA printed on a machine that is unable to accurately depict small details within the part. This article explains the steps required in order for a Hub to initiate a refund to their customer and how it’s handled by 3D Hubs admins. 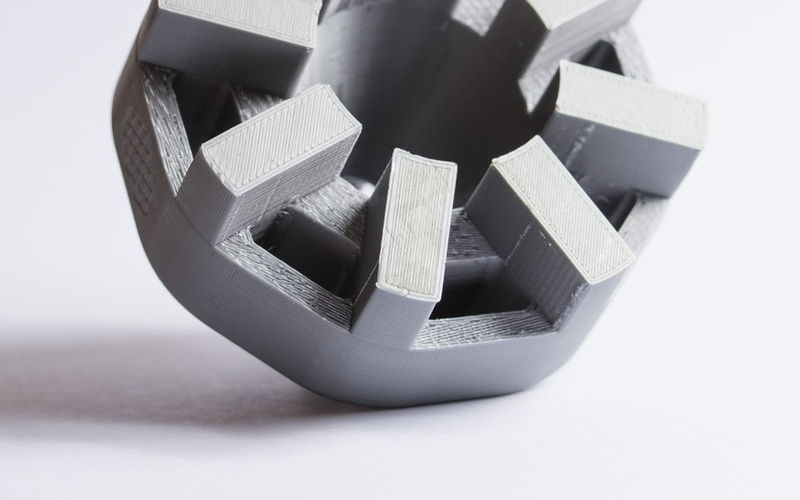 The goal of the SLA/DLP Quality Guidelines is to standardize the handling of SLA orders on 3D Hubs. 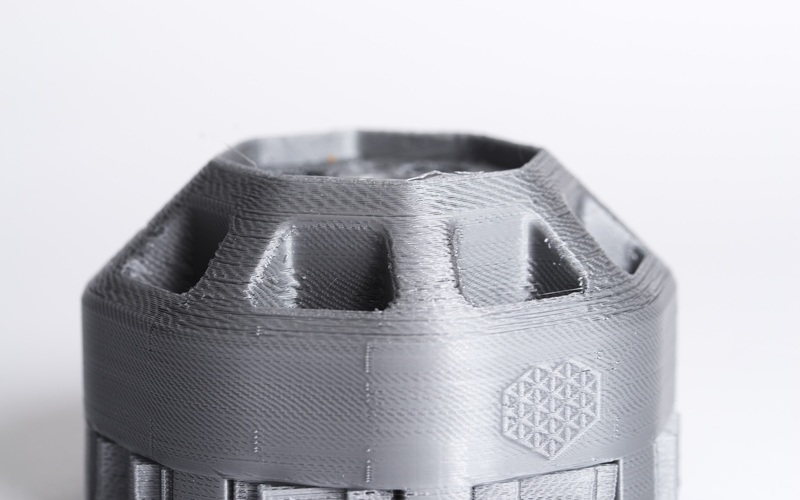 This will result in a reliable experience for all customers using SLA printing through 3D Hubs.